One of the most talked about caravans at this years NCC Motorhome & Caravan Show at the NEC in Birmingham was the new Monopod 660 from IH Leisure (sister company to IH Motorhomes) – With it’s perfectly smooth, one piece monocoque body shell and space age looks it was unlike anything else being exhibited at the show. IH Leisure told us that there will be a number of layouts available for the Monopod 660, but that because they were being made bespoke for each customer the interior finish and specification options were virtually limitless. Even the outside can be painted to match the towing vehicle, making this a truly customisable caravan. That level of quality and customization does come at a cost though, and with prices starting from £41,995 this caravan is definately at the luxury end of the touring caravan market. 10 year water ingress guarantee: With less joints and seams for water to get in to, IH Leisure are confident enough to offer a market leading water ingress guarantee. Custom painted exterior: Have the exterior shell finished in metallic paints to match your car or your tastes. Custom interior: Because each caravan is handmade IH Leisure can offer bespoke adjustments to suit you. Large 400+kg payload: With such a large payload you can be sure you’re free to bring everything you need (however, be sure to read our article on correctly loading your caravan to ensure you are safe to tow the weight). Aerodynamically stable: The aerodynamic shape of the outer shell makes the caravan more stable when towing and less susceptable to wind from any direction when on site. Spacious interior with a very high level of interior finish and styling. 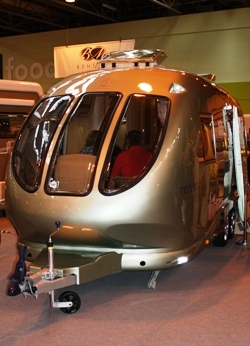 Unique, modern exterior shape unlike any other caravan currently being made in the UK. Because of the Monopod 660’s high list price, in order to provide insurance Caravan Guard would require owners to fit an approved tracking device as well as to store at a secure storage location such as at home with 24 Hour locked gates, although at over £40k we think these are precautions that any sensible caravanner would take anyway. 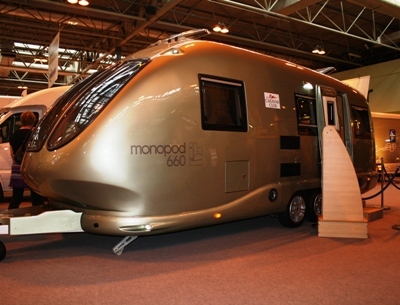 * Caravan insurance cost based on IH Leisure Monopod 660 valued at £41,995. Fitted with hitchlock, wheelclamp, alarm, and Caravan Guard approved tracking device. Kept on drive behind 24 hour locked gates at HX4 0BE. Caravanner over 30 years old, claim free for 3 years and a member of a caravanning club. Quote includes 10% online discount and 6% Insurance Premium Tax and is correct as of 24.10.11.